Polyethylene Wax Market size crossed USD 250 million in 2016 and is estimated to grow at around 3% CAGR to 2024. Increasing product demand in polyvinyl chloride (PVC) production will be the major factor stimulating the polyethylene wax (PE wax) market size in the near future. The product is used to improve abrasion resistance and molding complexity. Lubricant usage is crucial for the PVC industry for focusing on principal factors including machine melt pressure and equipment’s energy consumption. The product is the suitable lubricant and thus used in the PVC industry to improve its characteristics. 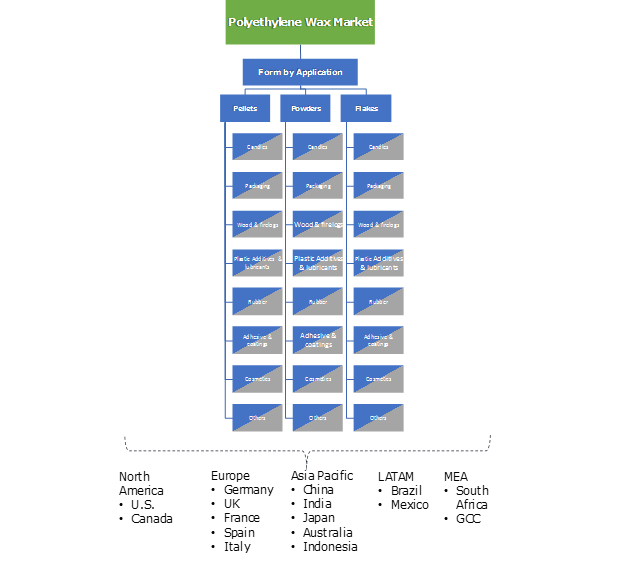 The global PVC market size in 2014 was close to 40 million tons, which will mark about 55 million tons by 2024. This escalation will positively influence the demand for PE wax in the coming years. In addition, widespread usage of the product as slip agent, dispersant, mold release agent and resin modifier in the plastic industry will complement growth. Furthermore, increasing construction spending in the BRIC nations along with uplifting construction business in the U.S. will boost PVC demand in the coming years. 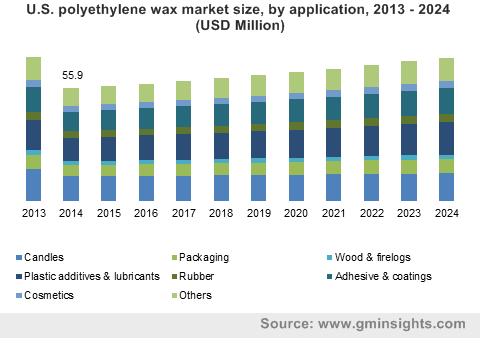 This in turn will boost the polyethylene wax market size over the forecast timeframe. The product finds printing applications across letterpress, silk screen gravure, flexographic and lithographic printing. The industry participants offer product used broadly used in in the printing inks formulations. The product enhances printing inks characteristics such as gloss and durability (due to enhanced coefficient friction). Therefore, inclining printing inks demand on account of its massive applications base in the packaging and labeling industry will ultimately drive the polyethylene wax market share by 2024. Global polyethylene wax market share faces stiff substitution threat from Fischer-Tropsch (FT) wax. FT wax is used in numerous application (printing inks, paints & varnishes, hot melt adhesives, textiles, and polishes) as an product alternative. In addition, odorless trait of FT makes it suitable to find applications across candles, packaging, plastic processing, fireboard and printing inks. Ethylene, is the key raw material used in the product manufacturing. Therefore, the industry follows crude oil price trends. These abovementioned factors might pose as major pitfalls for the overall PE wax market by 2024. PE wax is ideally used in the powder, flakes and pellets forms. The powder form led the market in 2016 and is estimated to follow the same trend over the forecast timespan. For instance, SCG Performance Chemicals states that the powder form with diverse viscosities results in better blending with other raw materials and easy processing. Powder form improves the flow of PE compounds, provides thermal stability & color stability, unique organoleptic characteristics and ideal dispersing properties for fillers, pigments and additives. PE wax can thus be used as an effective matting agent for wood coatings and other applications. Polyethylene wax market share for candles led the global market in 2016. The product is used in candles to amplify its characteristics such as gloss, hardness, burning rate and burning quality. Presence of the product also avoids mottling and improves the color distribution in colored candles. Increasing candles demand in China and India for festival and decoration purposes will subsequently propel the overall industry size in the near future. The overall polyethylene wax market share for packaging is likely to witness gains more than 3.5% CAGR over the estimated period. The product is widely used in paper & paperboard coatings for consumer goods, industrial and food & beverage applications. It provides excellent barrier properties against moisture and grease. For example, presence of product in packaging films helps in restriction printing inks spread into food. Increasing packaged food demand across the globe, supported by increasing working population along with improving lifestyle dynamics will drive the overall PE wax market size by 2024. Asia Pacific led global polyethylene wax market share and accounted for over 30% of the global volume in 2016. The regional growth was mainly driven by positive growth in the industries including automotive, construction, cosmetics and food. Improving socio-economic factor such as living standards, income and spending power is China, India and Japan will positively influence the regional PE wax market in the forecast timespan. For instance, the region accounted for over 35% of the overall construction spending across the globe in 2016. Additionally, the region also held a major chunk in the global automotive sales. North America PE wax market size was close to USD 60 million in 2016. Strong demand for wood, cosmetic and package food in the region has been significantly contributing to the industry growth in the recent decade. Uplifting status of the U.S. construction business post 2008 economic turmoil will boost product demand for coatings applications in the forecast timeframe. Furthermore, the region is a substantial package food business participant, which is analyzed to complement the product demand, thereby stimulating the regional PE wax market. Polyethylene wax market share is consolidated owing to the presence of few large-scale manufacturers. Key industry participants held about half of the overall industry volume in 2016. The leading manufacturers include: Honeywell International Inc., BASF SE, Arya Chem Inc., Clariant AG, Westlake Chemical Corporation, SCG Chemicals, WIWAX, Synergy Additives, Mitsui Chemicals America, Inc., The Lubrizol Corporation, Kerax Limited, Micro Powders, Inc., The International Group, Inc. and Innospec Inc.
Key industry share contributors including BASF SE, The International Group, Inc., SCG Chemicals and Westlake Chemical Corporation have integrated their operations throughout multiple stages of the product ecosystem, which has strengthened their global footprint in the business. For instance, few industry players such as Westlake Corporation and SCG Chemicals are engaged in manufacturing PE wax as well as polyvinyl chloride (PVC). Polyethylene wax is chiefly used in candles, adhesive, coatings, plastic additives & lubricants and cosmetic applications. Strong product demand in these applications has been the prime polyethylene wax market growth factor in the recent years. Plastic additives & lubricants application is likely to be the fastest growing segment, particularly due to massive product demand from the plastic processing business. However, volatile crude oil price trends along with stiff substitute threat by Fischer-Tropsch (FT) wax might hamper the overall PE wax market size in the coming years. Asia Pacific was largest region in 2016 in terms of both volume & revenue and shall observe highest gains over the estimated period. This regional growth will be mainly driven by robust automotive, construction and cosmetic demand.